Setting: Is there a place more wrought with possibility than the sea shore? Where two worlds—each exclusive of the other—meet in roiling tumult, the strangenesses of the deep are vomited up, and the for-granteds of our lives meet their boundaries. What is happening at land’s end? Roll d10. 1: A drystack stone tower sits atop a low treeless promontory. The blackened remains of innumerable bonfires litter the top; a rough set of stairstep stones winds around the base, the void within little more than an abandoned firelighter’s hovel. While the base of the promontory is awash with wave-tumbled roundstone, the sea is now over the horizon. 2: A moot of treants—summer cypress and slumping willows—have gathered on the sand of the shore. One by one they have trudged beyond, buffeted and leaf-stripped by the surf, into the sea. They stand in mournful clusters, ritual suicides in the salt water. 3: Molpe and Thelxinoe, loveliest of ladies with bright plumage for hair, perch atop spires of rock just outside the surf zone. They sing—songs of joy and desolation to rend a man’s heart—at rather than to each other. Those who have heard the songs float face-down in the surf, wretchedly attempt to claw their way up the spires, or slump stupored with the sea lapping their feet. Molpe and Thelxinoe eye the number of men bewitched by the other, competing. 4: Some colossal denizen of the deepest reaches has washed ashore. An enormity of swim bladders and appendages and milky white sensory organs, the carcass has become an ecosystem in itself for every parasite, scavenger, and opportunistic predator of the coast. 5: A rat-king of corpses floats in the surf, a tangle of arms and legs and torso, all atwist in and about each other, a flotilla of rot and bone and bloat moving of an accord exceeding the pace of the surf. It scrabbles and claws and snaps, a slow-motion massacre making way to shore, hindered by the ebb and flow of seawater and the counterpurpose movement of dead men inextricably twined. 6: Flotsam of shipwreck has washed ashore in a since-passed gale. Among that detritus and wrack are bedraggled mariners, sea-battered and parched of thirst. A greeting party has ridden to meet them, with waterskins and warm clothes and slavers’ manacles. 7: A simple greenglass bottle lies upon the shore. It is stoppered with cork and wax. Within is a scrap of vellum—roughly sliced from a larger sheet—with a few words scrawled upon it in sun-whitened ink. Written is a brief message pertaining to whatever the reader most dreads (even subconsciously) at the time of reading. 8: Hairpickers and raggedymen crawl over the sea-washed stones, searching for strands of mermaid hair. Apothecaries pay handsomely for each strand, which are used to infuse elixirs having to do with breathing underwater. 9: A nonsensical structure lashed of bone-smooth driftwood and kelp crouches above the highwater mark. Local whispers hold that when the moons are right, the gillelves crawl ashore and perform unfathomable rites within. 10: Standing at the seacoast, the waves and water suddenly—and rapidly!—begin receding, all the way to the horizon. Guess what. 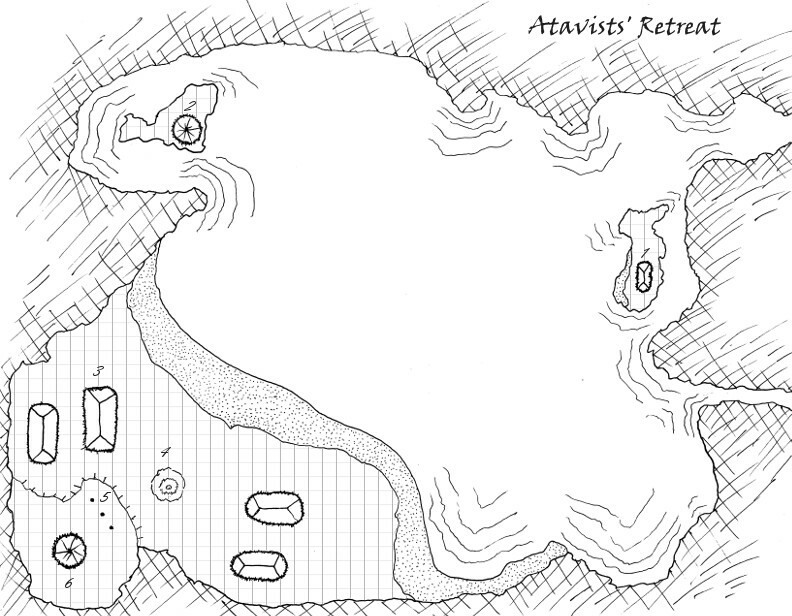 In an isolated grotto hides a settlement of saltwater lizardfolk. Reclusive, primitive, proud, and fierce, the lizardfolk have colonized the sea-cave and–it being the repository for the tribe’s eggs–will defend it to the last. There are two natural entrances from the sea, and the cavern is perpetually flooded. There’s an interior beach where the main settlement rests, an islet with a watch-hut, and another with the sacred hut of the tribe’s shaman. During the day the sea channels admit enough sunlight to illuminate the grotto; at night, the tribe lights a driftwood bonfire and the torches lining the beach. Day in the grotto is clean and clear with a saltspray tang; breeze carries away the smell of the lizardfolk. Evening finds the grotto dark and moody, all flickering firelight that never quite reaches as far as you would like. The grotto of the lizardfolk. Players’ copy. Lizardfolk are stern and sober, and don’t take well to visitors in the grotto without exceedingly persuasive justification. Any aggression–or uninvited visitors–will be met by a hail of javelins followed by the males of the tribe swimming out to greet the interlopers. GM’s version with grid. 10’x10′ squares. 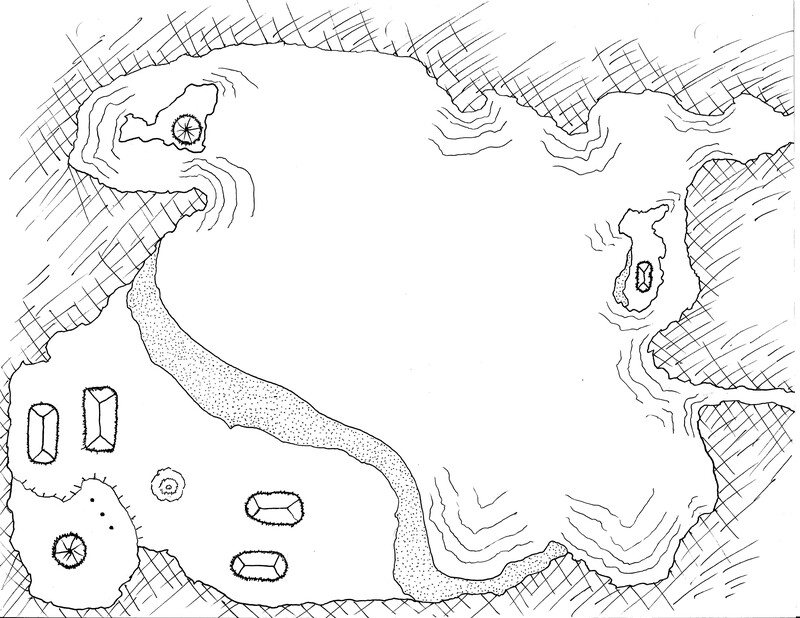 1: A small islet with a guard/warming hut. Typically occupied by warriors armed with javelins and a warning horn. 2: The tribe’s sacred island. Hut with a low fire perpetually burning inside; used by the tribe’s shaman for vision quests and mystic isolation. Equal odds at any given time that the shaman is on the island, or back with the rest of the tribe. 3: These communal longhouses shelter the majority of the tribe. Lizardfolk are communal creatures, huddling together when temperatures drop. 4: The tribe’s firepit. Every evening the tribe stokes up a huge driftwood fire, later taking shovelfuls of coals back to the longhouses to warm them through the night. 5: Prisoner posts. When the tribe captures prisoners, they are bound here as both an example to the tribe of the chieftain’s might, as well as a way of keeping the tribe’s food fresh on its feet. 6: The chieftain’s hut sits on a ledge a few feet higher than the rest of the village, befitting the largest and oldest male in the tribe.